Being born into a Marxist country, the present author believes that material conditions are very important. It was therefore of great interest to me to relate how the foreign population of Pyongyang lived while I was there in the mid-1980s. At that time, North Korea had a rather unusual three-tier currency system, which was partially inspired by similar systems in contemporary China and the USSR. At the very bottom was the local North Korean currency. This would buy little, since in most cases such currency would be useless without rationing coupons. However, the North Korean authorities did not openly admit that a rationing system existed. Thus, if a foreigner attempted to purchase an item on open display in a regular shop, the clerks would usually sell this item without asking for rationing coupons or tickets. Some more entrepreneurial North Korean roommates made use of this privilege. In one case, a North Korean roommate gave an East German student a rather large sum of money. The foreigner was asked to buy wine in the first department store – then as now, the major shop of the North Korean capital. 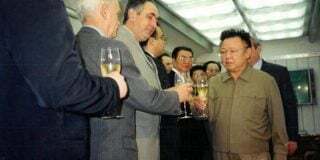 North Koreans would not be allowed to buy wine or liquor without the requisite rationing tickets, but nobody would ask a foreigner any questions. The North Korean roommate then moved a few boxes of the wine to his native town, far away from Pyongyang, and sold them at a huge profit. Predictably, the North Korean roommate was young cadre of the Party Youth League – this was a time when the North Korean nomenklatura began to learn how to make money in the emerging market economy. Admittedly, there was very little on display in the average North Korean shop. 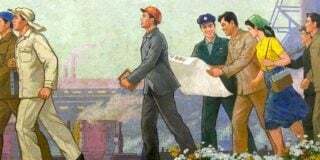 I remember how surprised I was in the summer of 1985 when, having returned from North Korea, I took a trip to the Soviet countryside and entered a small village shop in the middle of nowhere. Normally, for a native of Leningrad, such a shop would present a picture of abject poverty. But after my trip to North Korea, it appeared as if this village’s humble shop was stocked with unimaginable riches – there were a few different kinds of canned fish, canned fruit, as well as many other items never to be found in North Korean shops of the era. At this time, the “green changed currency” notes was issued in exchange for non-convertible currencies, i.e. currencies of fraternal communist countries, as well as some developing countries of the Third World. In practice, ‘green’ notes were issued to the citizens of these countries by their embassies or state banks. In other words, the “green” pakkunton was the money that Soviet citizens and other Eastern European citizens were usually paid in. The red “changed currency” was issued in exchange for hard currency, like dollars, yen or West German marks. This money looked identical to the green equivalent except for its red stamp. However, as you might expect, this currency enjoyed far greater purchasing power. 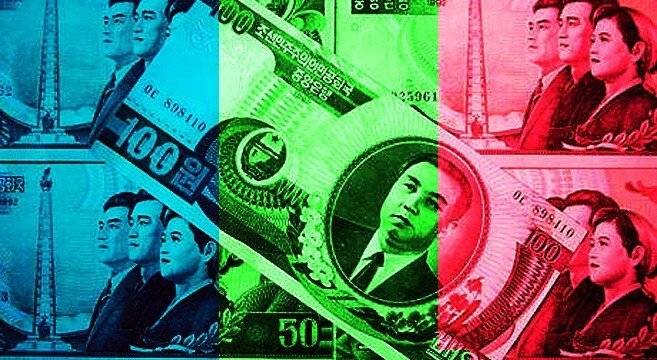 Around 1987, soon after our departure, the North Korean banking authorities initiated a minor reform, and reversed the roles of the green and red “changed currencies.” From the late 1980s and until the disintegration of this system around 2000, it was the “green changed currency” that was issued in exchange for hard currency and it was the “red changed currency” issued in exchange for communist (including Chinese yuan) and Third World currencies. This reversal makes some symbolic sense: the red is, obviously, the color of revolution, while the green is in many countries associated to the U.S. dollar, the quintessential ubercapitalist currency. However, please keep in mind that we are talking about 1984-85 in Pyongyang, so I am inclined to stick to the system used back then before the stamps were changed. In regard to the money, the Soviet students were lucky. On average we received higher stipends than Eastern Europeans – and on top of that, 10 percent of our salaries was paid in “red” notes (the rest in “green” notes). This meant that even students could think about buying some kind of expensive equipment before they left Pyongyang. Like pretty much all my fellow students, I bought a very good Japanese stereo with tape recorder and short wave radio. There was a rather strict segregation of shops in which the two kinds of “changed currency” could be used. The major “green” shop was the Pyongyang department store located in the East of the city at the centre of the “embassy quarter.” The shop had a rather simple selection of imported and better North Korean goods. To me, it looked pretty much like a relatively good shop in the contemporary Soviet Union. On the first floor, one could buy sweets, fresh poultry, pork and fish, as well as assorted canned foods. The second floor was devoted to consumer durables like bicycles and tunable (and hence heavily controlled) radios. The green variety of “changed currency” could also be used in a number of eateries exclusively for the foreign clientele. Such outlets were mainly to be found in foreign hotels, though there were also places in the embassy quarter and nearby. The “red” notes were at the apex of purchasing power in the North Korean consumer economy. There were a number of shops in the city where only red “changed currency” would be accepted (in some places they would also accept actual hard currency as well). The largest and most well known was a two-story department store on Ch’anggwang street with the telling name of Rakwon (or Paradise). 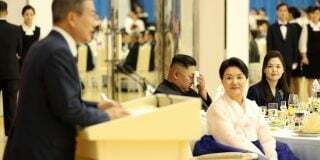 By contemporary North Korean standards, this place was a paradise indeed – looked very impressive, even to the humble author, for whom North Korea was the first foreign country he visited. Paradise was basically a very small Japanese department store, and it was widely believed at the time that the owners were ethnic Koreans from Japan. On the first floor they sold foodstuffs, overwhelmingly imported. The second floor had consumer durables of all kinds, including an impressive variety of consumer electronics. While foreigners were among the vast majority of visitors to green currency shops, Paradise and the other red note shops largely had a North Korean clientele. The Soviet Union of the time had remarkably strict restrictions on the use of hard currency. Thus, I was quite surprised when I saw that anyone with a few dollars in their pocket could get into such a shop and buy things with no questions ask by the ubiquitous uniformed and plainclothes police. Most Korean shoppers were believed to be ethnic Koreans from Japan who had come North during a massive repatriation campaign in the early to mid-1960s. In the mid-1980s, their relatives were still willing to send them significant amounts of money, which they could use in Paradise and other similar places. There were also Koreans who received monetary gifts from relatives in other countries, as well as officials, who at the time had begun to acquire a taste for hard currency as well as learning ways to make it (usually though different forms of corruption). In front of Paradise, one could often see Mercedes with KWP central committee number plates. However, this was a world of modest consumerism enjoyed by but a small number of expats and people dwelling in the corridors of power in Pyongyang. Neither “green note” or “red note” shops were places one could encounter average North Koreans – these people had lives vastly different from top officials and expats. Subscribe to read the remaining 1398 words of this article.